Tunic tops are very popular fashions for women where at least one will most likely to be found in every closet. They come in different lengths, colorful patterns, and solid natural colors. Tunics come in regular lengths like regular tops that come down to and drape over the hips, longer lengths where it cuts off at the knees like a kurta from India, and very long lengths where it goes all the way down to the ankles like shirt dresses. The other great thing in wearing tunic tops has to do with selecting items to wear to spruce up the overall look by using jewelry, necklaces, and belts and this article will teach ladies how to accessorize a tunic top in a way that will make it look really sharp for all almost all occasions and could also turn it into a new type of fashion. Tunics first became the tops of choice among Hippies who wore them over loose pants and long Boho skirts, thus creating a new Boho fashion style in the early 70s. They were made from light, natural flowing fabrics such as silk all the way to knit, and light denim. The colors came from nature and tunics mainly had colorful ethnic prints from Mexican, Native American, Asian, and African groups. Accessories often selected are jewelry, purses, shoes, and scarves and wraps that came from the ethnicities and countries they represented. The accessories and Jewelry made from those areas were often made out of different natural materials such as colored wooden beads, bone, shells, stones, gems, leather, some came with medallions of carved figures such as animals, religious and, peace symbols. For example, for those who wear tunics, beads and necklaces that come from small single strands or multiple strands of different size colored beads are the most popular accessory people choose to wear. Beads and necklaces should be selected so they will be seen on prints. Necklaces with larger beads or even stacked beaded necklaces would be more visible and would look great on tunics with prints. Tunics are normally worn as is because it's less restricting for the wearer and it has a comfortable free-flowing feel to it. However; they can also be turned into a new fashion by adding belts made from fabric, leather, silver turquoise chain, sashes, or even ribbons that will turn them into belted tops for shorter length tunics or belted dresses. Shoes or boots selected should be the same color as the tunic belts. 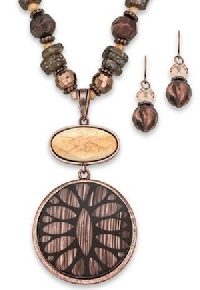 Finally, to complete the look, select earrings, bold necklaces, and beaded bracelets that will complement the tunic. The nice thing about selecting jewelry is there are endless varieties of styles that could be worn and will look great with tunics. The main point to remember is to select jewelry that will add style and will be visible while wearing the top. To conclude, tunic tops are among the most popular fashions in style today. They come in many different styles and colors plus, they are very comfortable to wear because they are free flowing tops made from light materials and, they can be changed from a tunic to a belted shirt or shirt by adding a belt. These tops are made from the lightest of natural fabrics such as silk to heavier knit fabrics making tunics a fashion that can be worn all year round. This article showed how to accessorize a tunic top where it ends up being a very attractive fashion addition that could be worn over any type of slacks, jeans, shorts, and long flowing skirts.